One of my recent articles outlined a three horizon framework for innovation. Let me extend this a little further. I’m sure we all agree Innovation needs to be worked at, it needs to be understood and often many people do get confused by not taking a more measured approach to the need to break innovation down into its manageable parts. Innovation does not just have a time axis that the three horizons framework refers too but it has a complexity and scope axis in learning as well. By taking a more systematic approach to any innovation you achieve a greater understanding over time of what is involved. Firstly you have to ask what you are trying to achieve, is it incremental innovation, distinctive, disruptive or even radical white space innovation? Do you approach innovation differently for each of these? I would argue you need to learn and build from one to another as you learn on the way, this is my going up a curve that increases in complexity and its scope/ outcome. 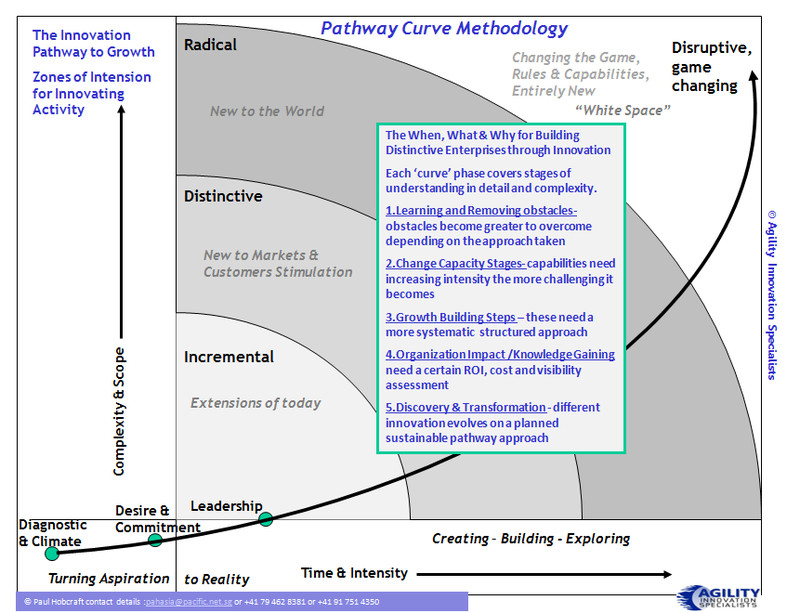 Getting a thorough understanding of what it takes to move up what I call this Innovation curve, does takes time, and growing a deeper understanding of how one step is followed by another in experience and understanding needs working upon. This is rarely understood and practiced in this structured way and that lack of understanding often creates the disappointment and frustrations that an organization is not achieving that innovation success they desire. The more you move steadily up this curve the more you can explore the different types of innovation with growing confidence and success. 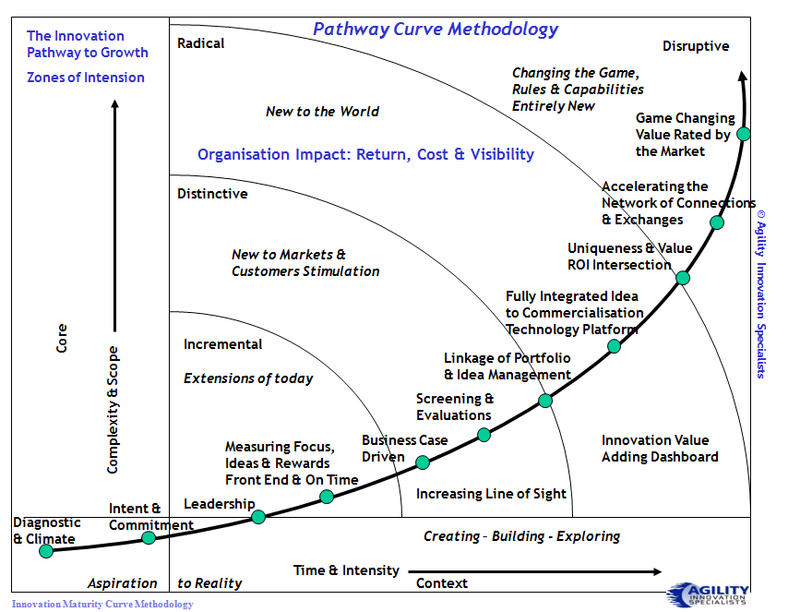 There are five separate curves of learning– 1) dealing systematically with obstacles, 2) building capability and capacity to move methodically up this curve, 3) the building and understanding of different approaches to innovation for growth building, 4) recognizing the organizational impact and knowledge needed and finally, 5) a discovery and transformation curve. Let me illustrate one of these five learning curves to provide a little more of an understanding by taking the aspects of needed learning for organizational impact, gaining improved return (ROI), controlling of costs and increased visibility. You need to be very structured in this approach, it may look like a slow build but in any ‘fitness’ requirement you build in a methodical way. What is it to achieve, is it incremental, distinctive, radical, disruptive and how do you manage this in a clear way to support any initiative. In future blogs I will expand on the need to plot your Innovation Fitness Landscape and the ability to identify your organizations Dynamics of Innovation. Progressively we will be moving towards the DNA of Innovation much of the intent that this blog is all about. This entry was posted in Uncategorized and tagged dynamics of innovation, innovation methodology, innovation pathway, Innovation Structure, three horizon approach. Bookmark the permalink. Woudn’t time and intensity be negatively correlated? Also, time is a good measure but wouldn’t urgency be a better measure than intensity? Intensity is pretty hard to measure, and certainly has many more dimensions than does time. As theory your work looks pretty good, but if you were to subject it to a formal research process it might require you to be a bit more specific/focused. Would really love to see you subject this to a formal research effort.